Abstract. Environmental heterogeneity is ubiquitous, but environmental systems are often analyzed as if they were homogeneous instead, resulting in aggregation errors that are rarely explored and almost never quantified. Here I use simple benchmark tests to explore this general problem in one specific context: the use of seasonal cycles in chemical or isotopic tracers (such as Cl−, δ18O, or δ2H) to estimate timescales of storage in catchments. Timescales of catchment storage are typically quantified by the mean transit time, meaning the average time that elapses between parcels of water entering as precipitation and leaving again as streamflow. Longer mean transit times imply greater damping of seasonal tracer cycles. Thus, the amplitudes of tracer cycles in precipitation and streamflow are commonly used to calculate catchment mean transit times. Here I show that these calculations will typically be wrong by several hundred percent, when applied to catchments with realistic degrees of spatial heterogeneity. This aggregation bias arises from the strong nonlinearity in the relationship between tracer cycle amplitude and mean travel time. I propose an alternative storage metric, the young water fraction in streamflow, defined as the fraction of runoff with transit times of less than roughly 0.2 years. I show that this young water fraction (not to be confused with event-based "new water" in hydrograph separations) is accurately predicted by seasonal tracer cycles within a precision of a few percent, across the entire range of mean transit times from almost zero to almost infinity. Importantly, this relationship is also virtually free from aggregation error. That is, seasonal tracer cycles also accurately predict the young water fraction in runoff from highly heterogeneous mixtures of subcatchments with strongly contrasting transit-time distributions. 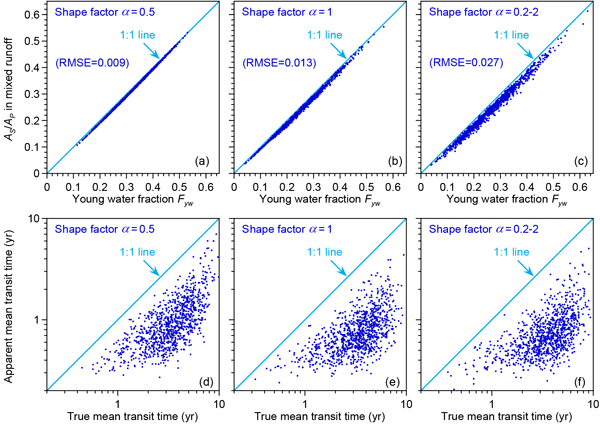 Thus, although tracer cycle amplitudes yield biased and unreliable estimates of catchment mean travel times in heterogeneous catchments, they can be used to reliably estimate the fraction of young water in runoff. 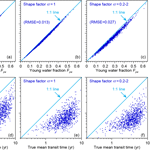 How to cite: Kirchner, J. W.: Aggregation in environmental systems – Part 1: Seasonal tracer cycles quantify young water fractions, but not mean transit times, in spatially heterogeneous catchments, Hydrol. Earth Syst. Sci., 20, 279-297, https://doi.org/10.5194/hess-20-279-2016, 2016. Catchment mean transit times have been widely inferred from seasonal cycles of environmental tracers in precipitation and streamflow. Here I show that these cycles yield strongly biased estimates of mean transit times in spatially heterogeneous catchments (and, by implication, in real-world catchments). However, I also show that these cycles can be used to reliably estimate the fraction of "young" water in streamflow, meaning water that fell as precipitation less than roughly 2–3 months ago.